As usual, our planning for this flight began a week earlier. With three old retired guys, who are way too busy with too many other things, a lot of advanced planning is always required. 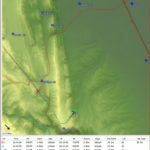 Springtime is the best opportunity for good flights along the Mendocino Mountains in Northern California, so we were watchful of the weather models. As the targeted day for the flight came closer, I began posting on to Williams Today – aka The Forum. Looks like a good day to do a basic 300 km flt from WSC. Start at Goat, turn T15, and Rumsey, then back to WSC. Easy three hour flight, unless we extend it. The RASP from the night before was looking good, however, the next morning the report was not as favorable. From the soundings you could tell that the high cirrus or at least the increased level of moisture in the air above 15000 ft was going to minimize the heating. It was going to be a more challenging day, and so it was. I was overly cautious about not getting low on the west side of the Mendos, and was fully expecting to find lift on the eastern slopes. You will see how I tried, but failed to make any progress northward past Diamond M. Key found the critical thermal (1 mile WNW of Sheet Iron). I have the digital flight record of each of us ‘Three Amigos’ and I’ll post a report in the morning. Final glide home via Rumsey. Key won the day for both altitude and the furthest north (first leg) and Jim won the day for the best final glide from Goat to home, via Rumsey (last leg) – I won the day for the middle leg, best glide from Black Butte to Goat. (Raw score, handicap not considered on any of these “wins”). The flight of the Three Amigos, Key is labeled “SD1” Jim is “1B” and I am “88”. You’ll enjoy replaying the traces, as you will learn things, I am sure. My flight is posted to OLC. I don’t know if 1B or PS plan to comment about their flights, but they gave me a copy of their digital flight record to show here, so I will attach each record to the end of this posting. That way you can play them in the “See You” Program, Animation mode and relive the flight and see the relationships. Here are some highlights in graphic form, along with my narrative. 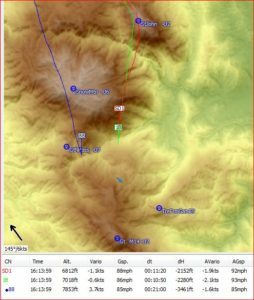 I was expecting to find lift along the eastern slope – as was reasonably predicted by RASP, considering the light flow of wind from the East, but it wasn’t there and I went as far north as I dared, reversing course at 14:35, while at 6,200 ft, at the top of the canyon west of Diamond M.
PS/ SD1 had discovered, and was now entering, the critical thermal of the day – on the ridge west of Sheet Iron, while 1B was headed back to St John for altitude. only ten minutes later he was reversing course to the south at 7600. I had made it back to the blue roof (a landmark east of sheet iron) and 1B was working in the St John Thermal. By 14:58 PS was up to 9,800 ft again and was about to head north, but I was unaware of his exact location and never did see him. Jim was still at St John about to head north again. 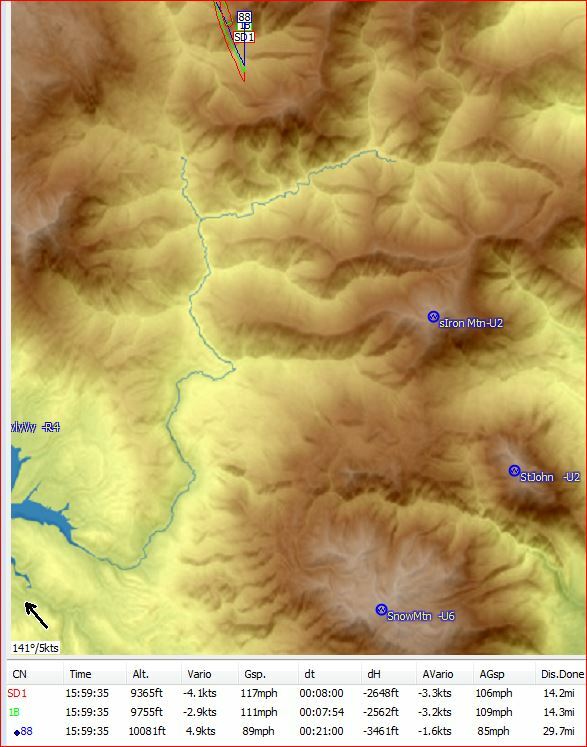 By 1536 Key had turned Anthony and returned to Blk Butte to join Jim who was now at Blk Butte and I was now finally northbound at 8,600 ft. The two of them (Key and Jim) decided to head south to pick me up, as I proceeded north bound. I was tail-end-charlie. At 1539 they were closing on me, and we were less than two miles apart, but I didn’t see them and they didn’t see me. As we reported our DME to each other they concluded that they were now two miles south of me and so they reversed course at 15:40 to catch up with me. The two of them come up along side of me as cruised toward the Black Butte turn point. I said I would reverse course a half mile past Black Butte. We then all proceeded southbound, but as Key was about to pass me he stopped for a thermal so I joined in and climbed with them. 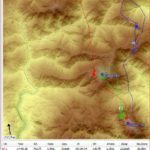 I was now on top of the thermal again and ready to head south, so, lacking any declarations on their part, I announced that I was now heading for Goat Mtn Turnpoint. 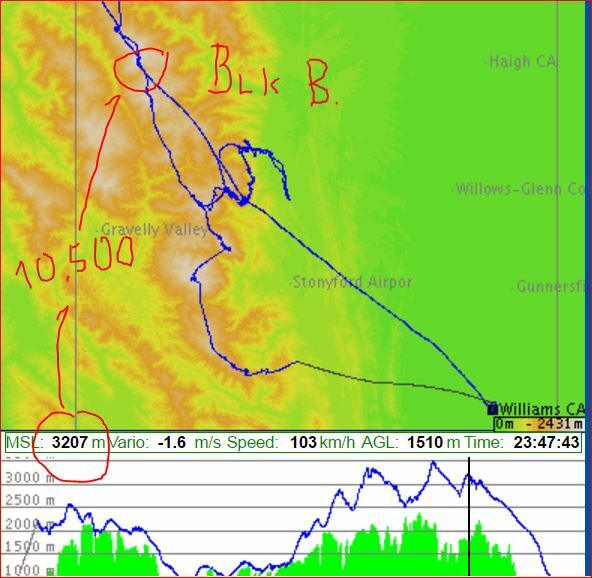 From this point we could have just glided straight home to WSC, which I see is what Sergio did, looking at his trace on OLC . 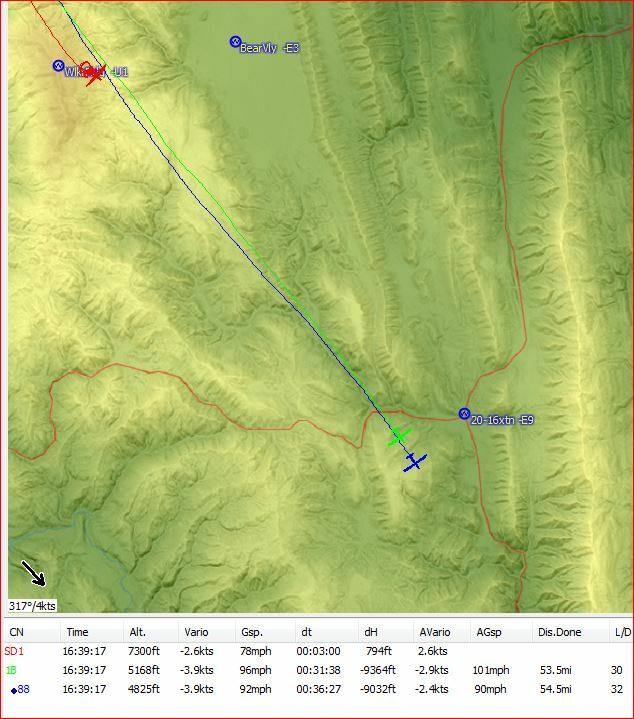 You can see C2 was at Black Butte at 23:47, that’s 16:47 local time at an altitude of 10,500 feet. He glided straight back to WSC and landed 50 minutes later. That was a 50 mile glide with no turns. I had made up a flight plan the day before that had a planned course back to Goat and Rumsey (see beginning of this thread). 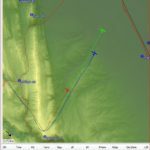 I could see we were in a perfect position to practice a max performance glide to Goat Mtn Turnpoint, now just a bit over 25 miles ahead, so I continued southbound. At 15:59 we were all playing nice together. I reported I could make Goat TP on a direct flight. Jim said he was something like 5 or 600 feet below at a MC of 4. Key said he showed about the same but didn’t say what his MC was. I had a MC of 2 or 3 and showed about 50o low, but I figured I could make that up easy enough, as I was going to pass directly over the top of Snow Mtn. and I planned on slowing to best glide speed if the arrival altitude became critical. At that point they said they were going to Sheet Iron, I said I was going straight to Goat. Guess they wanted to demo something other than what I had in mind. PS and 1B have flaps on their ships, which enable them to change the shape of their wing, and thus fly about 10 knots faster than my standard class glider, with no flaps. I am guessing here, but rather than fly at their best glide speed with a lower MC, they prefer to just go fast. In my opinion, if they had simply set their flaps to negative, and flew at the same speed as me (about 70 kts) (very boring), we would all have arrived together at Goat at the same time, but the two of them would have been almost 1,000 feet higher, but we’ll never know. FYI: At 70 knots, I was flying at least 1o knots above my best glide speed and they would have been flying right ON their best glide speed. 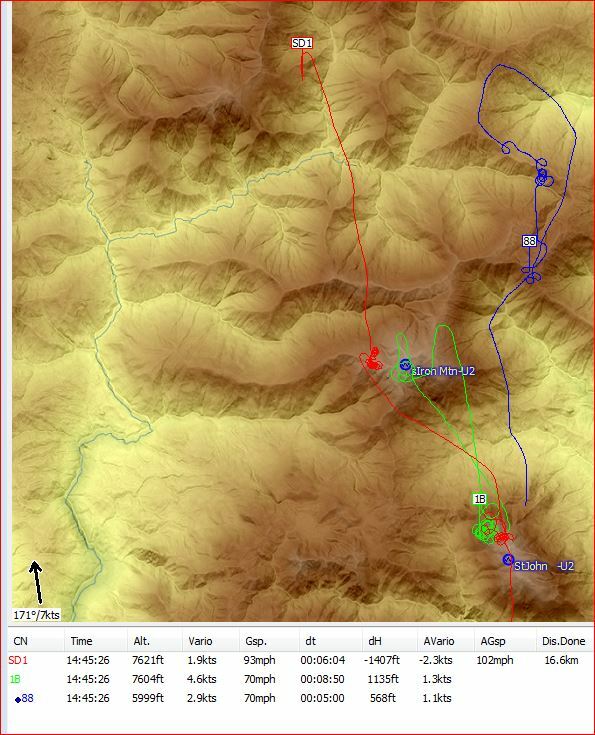 The altitude difference at the end of that 25 mile glide would have been somewhat telling, if not remarkable. By 16:07 I could see them over there at Sheet Iron, I was going slower than them but we were all at the same altitude, but now, I was closer to the Goat TP. They went whizzing past St John when they heard me report passing over Snow Mtn, but I was in a good line of lift, and could go really fast and could easily stay ahead of them. 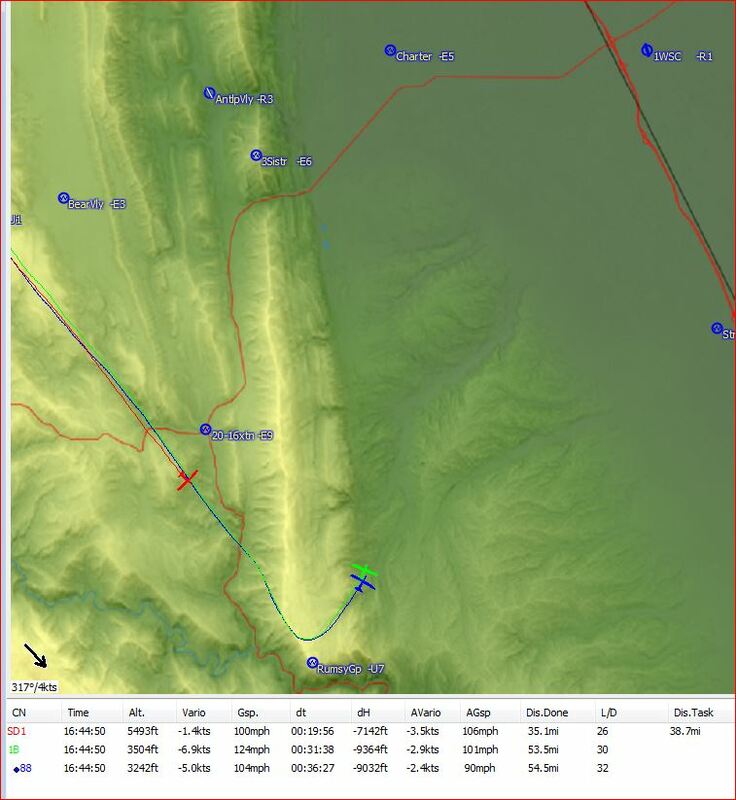 At 16:16 I was doing over 100 kts but staying well above them because I was in a better line of lift. 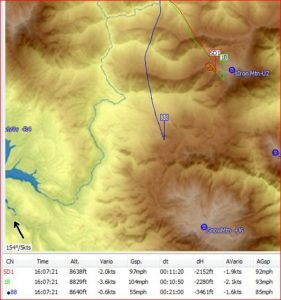 We all entered a thermal on top of the Goat TP, and four minutes later I was at the top of the thermal at 9,100 ft and I declared Rumsey to WSC for the final glide and off I went. I was fully expecting the two of them to pass me before we arrived at WSC since Jim was now only 500 feet lower than me and Key about 700 feet below Jim. Each of us had enough altitude to make it home via Rumsey TP, barring any extended areas of sink. 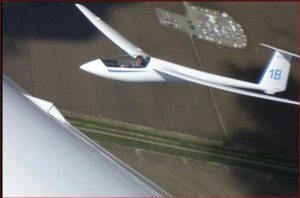 Key prefers to fly fast and it looks like he wanted the altitude to do so, or maybe he had decided to take a leisure glide home as he lingered behind as we headed for home – another mystery. 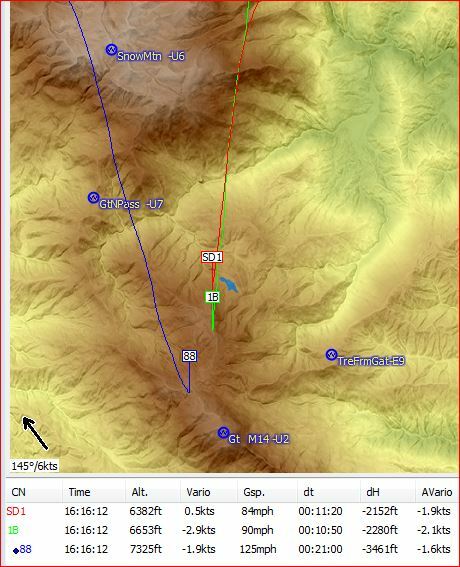 At 16:26 we were each on final glide. Now it was just a matter of flying the right speeds. Based on this graphic, I would have bet money that I would finish last, Jim would be first, and Key would be ahead of me. At 16:39, as we passed the Hwy 20/16 Turn Point, I could feel Jim’s presence behind me, I knew it was going to be only moments before he passed. Key stopped once again for altitude over Walker, but I have no idea what that was about. At 16:50 Key may have been considering a high speed final as he was closing the gap behind me. 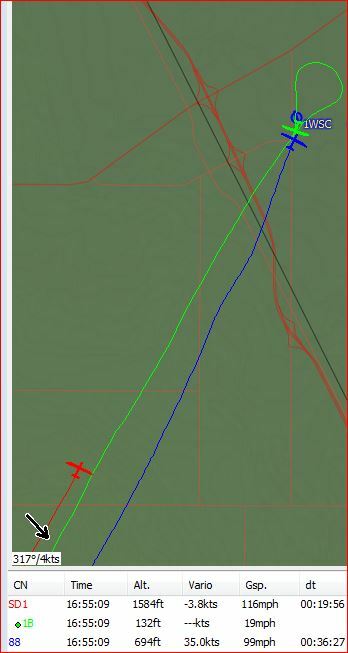 But Jim was soon parked (ground speed 19 MPH) and I was entering the pattern at 16:55. It sure was a fun day, but a lot more work than any of us had anticipated. The high cirrus and moisture certainly cut back on the thermal strengths and the pressure pattern resulted in winds that were less than favorable for good thermal development. End of report, and now for additional education…. After writing this report I solicited input from the other two Amigos, and true to form they graciously provided insight on this flight. Before I print their comments, let state some background info. Before the flight I had asked Jim and Key if we could fly “together”, rather than each running off and leaving “tail end Charlie” to just try to catch up by the time we returned home. I had suggested that we get together periodically during the flight by having those in the lead double back, and then we would all restart together for the next segment of the flight. Then, once reassembled, we would once again pick a goal for the next reassembly. I won’t go on about the give and take that ensued during preflight, but suffice it to say, Jim and Key did in fact run off and leave me, but to their credit, they doubled back and escorted me to the turn around of Black Butte Turnpoint. We were all playing nice together and enjoying the day. … As you saw in the above one sided narrative by me. That was what that narrative was about when I said I declared…. OK, enough intro… Oh, maybe one more comment… When we fly we are always trying to travel the maximum distance the day, and our bodies allow, but always wanting to avoid getting into situations where we are struggling for altitude, or in danger of landing out somewhere, other than WSC. That said, the three of us are essentially always in “racing” mode, to one degree or another. OK. Here’s input from Amigo 2, Key, aka PS, aka SD1, and then the input from Jim Darke, aka 1B. Key reveals (in a modest tone) how he was able to locate that crucial thermal…. …the success/failure of the day depended entirely on finding the one line of lift (was it convergence) up to Black Butte. Usually it seems we can find a range of paths going north (though some are better than others), but this line, which did not have any markers until just south of Black Butte, was crucial. Most of the time we find some lift at Sheet Iron, but none of us did that day. 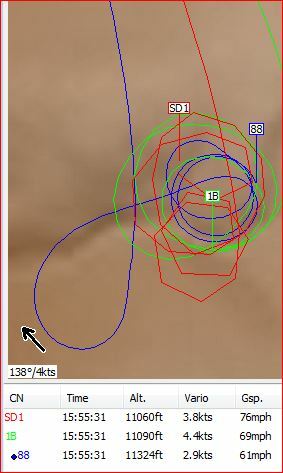 When i got there i looked at my Clearnav wind indicator and saw the wind at that point was shifted from south to west so i moved out from Sheet Iron in that direction. The first two times i moved north i hit heavy sink and came back. The third time it was easy–i don’t know why. Was it the little extra altitude? Did conditions improve? Or did i just move over laterally a little and stumbled into the lift line? 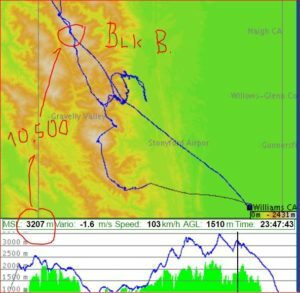 The trip from Black Butte back to Goat reveals the value of thinking each leg through and using all available information. I did not bother to check the Clearnav to see if i could glide all the way back to Goat, just mindlessly followed our outbound path. Like Key I was just pretty much in a take it easy and have fun mode on the way back from Black Butte. Following my path up there on the way back was the path of least resistance. Once I realized from your radio calls …. that we were in a real race mode, I tried to switch gears. When you left the thermal at Goat, I figured if I could get 4 or 500 feet more than you had at your departure and still be less than 5 minutes behind you, I could use the altitude and my left hand on the flap lever to easily beat you home. I think I was about 3 minutes behind and 600 ft. higher than you when I left. I did not use a glide around a corner calculation on the Oudie. 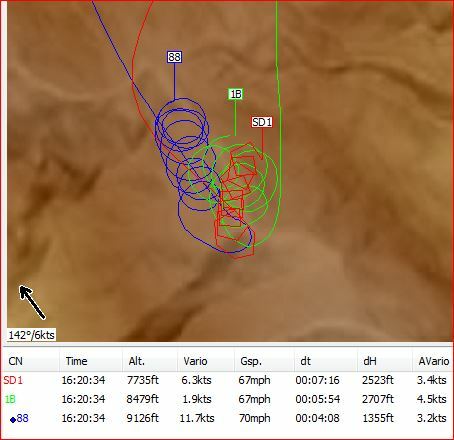 I pretty much just eyeballed it from the thermal at Goat I flew 80~85 knots (which is roughly speed to fly for a MC of 4) until I was about 6 miles out and then went to warp speed for a medium low (300ft) pass. Like you I was switching back and forth from Rumsey to WSC on the computer during the glide to confirm that I could make it comfortably. That’s some good insights from both Key and Jim. As for my planning on that final segment, I know from our “decades” of experience flying in this area that if you draw a 20 mile arc around WSC we know that Rumsey, Walker and Indian are all the same 20 miles distance WSC. 5,000 ft over any of them will get you back home 99% of the time. And, if you know the winds you can even reduce that to 4,000 ft. and still be comfortable with the glide home. 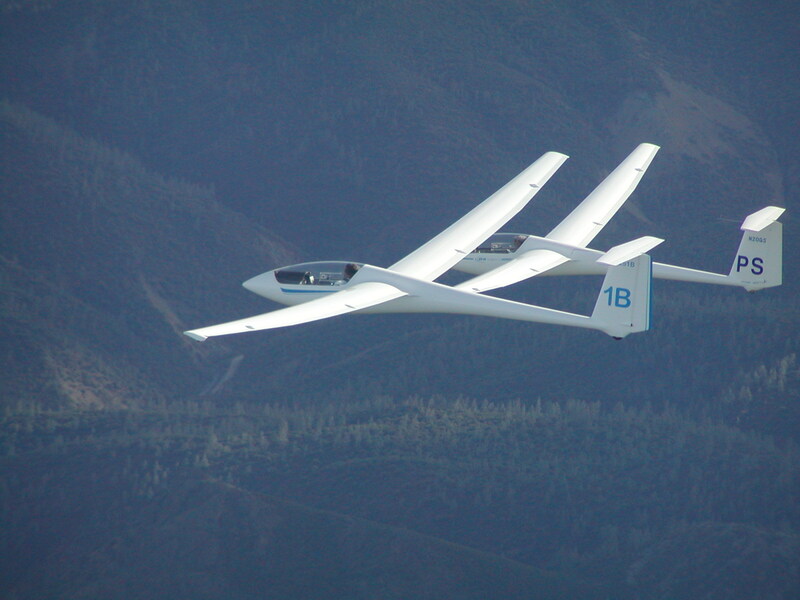 As for racing, it isn’t a race when you are not operating gliders with the same performance. It is more of a demonstration than a race. Any time the higher performance ship is below or behind the lower performance birds it is either bad luck or lack of concentration… Something all too common to us older pilots. I always fly at the best gliding speed, given rising vs descending (lift vs sink) in the air I am in, given headwind vs tailwind, and given what altitude do I want to have when I arrive at my next point. At any given moment, there is only one “speed to fly”, but unfortunately, that speed keeps changing as any one of the three variables change (sink, headwind, distance). If you don’t fly to a goal on every segment of every flight then you can’t very well determine what speed you should be flying. I set McCready (MC) numbers into my glide computers to determine altitude requirements to reach the next goal. I never use MC to tell me what speed I should be flying. I always fly best speed to fly for the situation.